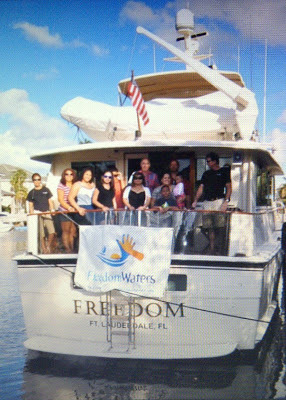 As we reported previously, the Captain and Crew of M/Y Freedom hosted Freedom Waters Foundation this past Saturday and what a gorgeous day it was! The weather was outstanding and everyone had a splendid time. We're preparing a collage of pictures for you to see, including one of young Jordan, receiving his Best Sailor award! We look forward to making this a regular event and hope to have the FWF folks and their guests back on board in the Spring! And we're looking forward to the collage you were mentioning about. Must've been quite the memorable experience to have setting sail on waters with the company of warm people. Thanks, Adela! We just posted it!